[Coke Effekt] wanted to push his server’s storage limits to a higher level by combining ten 3 TB drives. But he’s not interested in transitioning to a larger case in order to facilitate the extra hardware. It only took a bit of hacking to fit all the storage in a mini-ITX case. His first step was to make a digital model of his custom drive mount. This uses two 3D printed cages which will each hold five drives mounted vertically. To keep things cool the two cages are bolted to a 140mm fan. The connections to the motherboard also present some issues. He uses a two-port SATA card which plays nicely with port multipliers. Those multiplier boards can be seen on the bottom of the image above. The boards are mounted using another 3D printed bracket. 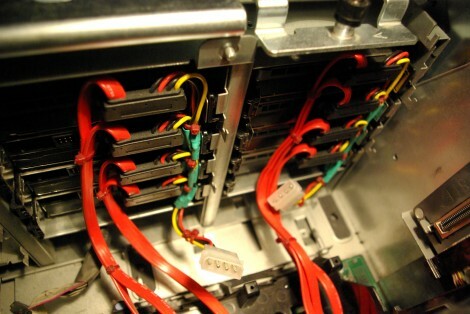 Each breaks out one of the SATA ports into five connections for the drives. [Andrew] was left wanting by the slow hard drive in his 2011 Mac Mini. He set out to add a 10,000 RPM drive and we think he did a great job of pulling it off. Luckily he also took the time to document the process so you can try it yourself. As with a lot of Apple products, a big part of this hack is just getting the darn thing apart without breaking something. Once that’s done, you’re got to do a little bit of interface hacking. To save space Apple uses a non-standard SATA breakout cable so [Andrew] starts by ordering a second hard drive cable from the company. He then soldered a thin wire connecting 12V from the motherboard to the 12V pin on a SATA connector. 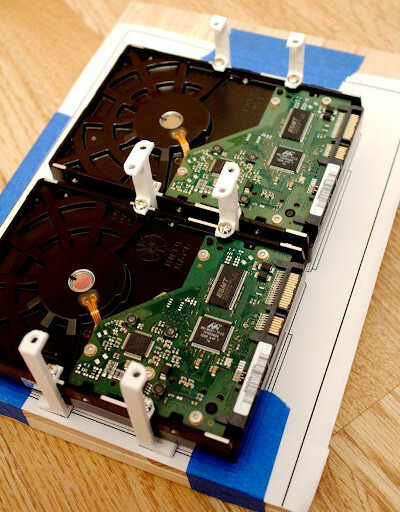 From there it’s just a matter of altering the original hard drive sled to make room for the 500 GB WD Velociraptor drive. It fits below the original and serves as additional space instead of as a replacement.